In 2000 she was highly honoured to win the Woman Entrepreneur of the Year – Lifetime Achievement, from the Women Business Owners of Manitoba (WBOM). Canadian writer who has published her first book; Roswitha-Memories of a Life’s Journey. As Roswitha write this book, it has not been an easy journey for her, but it has certainly been an exciting and colourful life. Roswitha - Memories of a Life's Journey Her first Autobiographical story filled with joyful and painful experiences alike. From her childhood in Germany during and post-war to her years in a refugee camp, her story is a heroic tale of determination and survival. Love, devotion and a sense of adventure brought the young couple and their children to Canada in 1967. Roswitha portrays the struggles of the early immigrant years in Canada and how she came to love this beautiful country. After years of hard work, Roswitha eventually realized her dream of owning her own elegant restaurant and the years of determination and desire for perfection culminated in the high honour of winning the Woman Entrepreneur of the Year - Lifetime Achievement Award, from the Women Business Owners of Manitoba. While writing her memoirs, she reflects on her life and, although it had not been easy, she has lead a truly colorful life. As you read through her journey, perhaps you will be encouraged and inspired by her great determination and courage. Through her struggles and her successes, she conveys the strong message that life's obstacles can be overcome. 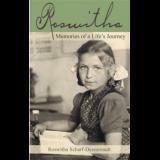 Roswitha, A Life's Journey is a story that is heartwarming and at times heartbreaking, but ultimately triumphant. Roswitha Dessureault's indominable spirit and optimism shine through on every page, reminding readers to embrace their own life's journey. I'm so glad that I met you and got to know you before reading your remarkable story. I thoroughly enjoyed reading it, even though it's heartbreaking at times. Through all the heartache you didn't give up, but bravely persevered, which speaks volumes of your inner strength, determination and faith. It's wonderful that you are now at a happy place in life and can look back and be proud of your accomplishments. This book transcends one woman story. I really loved reading it as a Canadian, a Winnipegger, as a woman, as a granddaughter, as a mother. It spoke to me on many different levels. Roswitha’s story made me grateful for everything I usually take for granted.